I really loved the apple and brown sugar flavor of those instant oatmeal packets when I was little. (I might even still like it now, but I’ve done my best to eliminate anything labeled “instant” from my diet.) We had an insta-hot faucet, so I could dump the powdered, sugary oats into a bowl and turn it into a snack as quickly as I could stir. 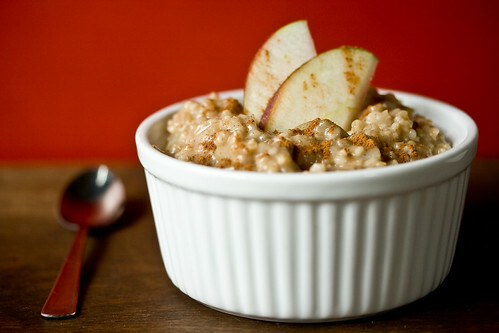 This recipe is the adult version, using a fresh apple and steel-cut oats. There’s also a little dash of nutmeg, and little dashes of nutmeg remind me of donuts, which is never a bad thing in my opinion. So let’s talk about oats. Steel-cut oats are the less processed version of the oats we’re more familiar with, rolled oats. At least, rolled oats are the oats I’m most familiar with. While rolled oats are just as much a whole grain as steel-cut, they have been steamed, flattened, steamed again and then toasted dry. A steel-cut oat is simply cut into three or four pieces and then dried. Some people say the rolled oat, being more processed, has less nutrition and less flavor than the steel-cut variety, but I haven’t found any conclusive proof of that (in three minutes of googling). There is a clear difference between the two; steel-cut oats take much, much longer to cook than rolled oats. It can take steel cut oats up to 40 minutes to cook, compared to rolled oats which finish up in a mere 5 minutes. Steel-cut retain their texture better after cooking, resulting in a chewier breakfast than standard rolled oats provide. Some people who are really into their oats insist that the steel-cut version has a nuttier, fuller flavor. 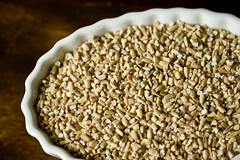 You’ll find many people willing to invest the time in steel-cut oats just for their toothsome texture and full flavor. Keep in mind oats come in more than these two versions. You can find whole oat groats (Wow. Oat groat? That’s really the term for it? ), which are the least processed and take the longest to cook. The next step down from the whole oat groat is steel-cut, then rolled oats, quick-cooking oats, and instant oats. Generally, avoiding both ends of the spectrum is the best advice. Whole oat groats take forever to cook (I think pre-soaking is even recommended) and instant oats are so mushy and formless, they’re not worthwhile when you can make quick cooking and even rolled oats in under 5 minutes. While I’m geeking out about oats, I should mention that quick cooking oats are generally preferred for making oatmeal cookies. I read that rolled oats can be used, but the dough should be refrigerated for 20 minutes to let the oats soften up by absorbing some moisture before baking. I’ve definitely used rolled oats in cookies without doing the refrigeration trick, so feel free to ignore this paragraph entirely if you’ve got a cookie recipe that works for you. Heat margarine in a small sauce pot that has a tight fitting lid. Add oats and toast them for 1-2 minutes, until fragrant. Add cinnamon and salt, stir well. Stir in hot water and bring to a brisk boil. Cover and turn down heat. After 15 minutes, add apple, milk, and sugar and stir. Cook for another 5 minutes uncovered, stirring occasionally. If after 5 minutes you’d prefer your oatmeal to be thicker, cover and turn off heat and let sit for an additional 5-10 minutes. This gives the oats a chance to absorb more liquid without running the risk of burning the oatmeal. Also, the oatmeal at this point is approximately the temperature of magma, so you might as well let it cool down a bit before you dig in. If you feel like dressing up your oatmeal, drizzle it with a small amount of molasses and a pinch of nutmeg, or sprinkle it with additional brown sugar, or add a fresh apple slice or two to the top. Yum! Oatmeal is absolutely my favourite breakfast food! I eat it every morning (rolled oats kind). I make it with 1 cup soy milk (replacement for water) and then I add nutmeg and brown sugar. When it’s ready I fold in some flaxmeal, sliced mango and kiwi slices. SUPER GOOD!!! Hey lolo. I put my steel cut oats in a microwaveable bowl (or in my stainless small pot depending on how much room is available in the fridge) with some water before bed. They only need to be warmed up in the morning. It makes breakfast nearly instant. awesome idea! i love the instants too, despite the fact they’re clearly not so healthy. mike – i loved the strawberry ones too! Yay for your oatmeal post! I really appreciate it because I eat oatmeal several times a week for breakfast — sometimes knowing I’m about to eat some oatmeal is what helps me roll out of bed! I just use the quick-cooking oats for time’s sake, but then you can dress them up any way I want and still feel like you’re having a totally different breakfast every morning! I like oatmeal with almond butter and dried figs; goji berries, cashew butter, and pumpkin pie spice; bananas and walnuts; or even sometimes with flax oil (after cooking) or nutritional yeast! By the way, what do you mean by “Cooking Apple” in your ingredient list? Also, kudos on your oatmeal pic! It looks gorgeous — I know oatmeal doesn’t photograph too well but you did an awesome job! Mmm… I’ll have to try oatmeal with soy margarine or with molasses per your suggestion. I’ve never done that before! I found the oat-geeking-outage adorable and fascinating. Miss you lots, friend. I’m so happy to see all this oatmeal love! Robyn – A cooking apple is just an apple that doesn’t totally dissolve into mush when you cook it. Any kind of an apple that you’d use for pie would work just fine in this oatmeal. Mmm, this just sounds so hearty and delicious. I haven’t tried steel cut oats in a long time. Now that it’s getting cold, this would make a perfect warming meal. Oh, and I used to love the peaches n cream packets. I would like to recreate that sometime. I never knew there were so many oats! I thought it was just rolled oats! Thank you for the enlightenment. This looks like the perfect winter brekkie! thanks for sharing. love love LOVE the steel cut oats – i discovered them a few years ago and haven’t been able to go back to anything that takes less than 20 min to cook (unless it’s for the purpose of cookie making). i haven’t, however, tried to toast the oats at the beginning before adding liquids – i’m looking forward to trying that! How do steel-cut oats fit in with the Scots oatmeal? I’m used to pinhead, medium and fine ground. This sounds most like pinhead. I have medium oatmeal everyday for breakfast. Either soaked in milk in the fridge over night and with some of whatever fruit is in the house added, or microwaved for about 3 minutes as hot porridge. I might try adding apple and nutmeg to the microwaved version tomorrow – that sounds really good. I’ve been using a different method recently. The night before I boil 1 qt water, and add that to 1 C steel-cut oats. stir, and go to sleep. When I get up, I cook them for maybe 3-5 minutes. I add some maple syrup, cinnamon, and raw sugar. Scoop into a bowl with some soy milk and raisins. The rest goes in the refrigerator for breakfast the rest of the week. The first time I added the raisins the night before for the soak. Whoops. I ended up with grapes again. Not an enjoyable mouth feel. I was under the (false) impression that steel cut oats were WAY better for you than rolled oats. So this post made me happy – I can make oatmeal cookies without feeling guilty for using the “less healthy” kind. I’m not even sure where I got that idea. But I LOVE the flavor of steel cut oats – the brand I use (McCann’s) makes a “quick and easy” kind, that’s just chopped a litle smaller, so cooking takes only 10-15 minutes. I recommend it! November 10, 2007 - 9:04 am Pingback: VeganMoFo: Pumpkin Steel-Cut Oatmeal « have cake, will travel! I’ve been experimenting with my rice cooker and discovered, lo and behold, you can make this in it with as much ease as making rice. I just toss everything in the night before – I like the steel cut oats with crasins, and then with some light cream and a bit of sugar on top for breakfast – and set the timer for when you want it ready. It totally eliminates the 40-odd minutes of cook time steel cut will need. They’re just as easy as rolled or instant, and so much more tasty! We are vegetarians, and I stumbled on your post yesterday. I showed your web site to my family and my daughter was saying I should buy your book. Your site and all the recipes are awesome. Please let me know where I can buy your book. Wow!! I love all the suggestions here for making this a more “instant” dish…from soaking overnight in the refrigerator, to the rice cooker with a timer on it. I might let my dad try that one, seeing as how he’s got the rice cooker…. All I can say is, this was a great recipe. I used coconut oil to toast the oats in and it adds such a nice flavor component. Also, a 1/4 tsp of blackstrap molasses and 1 T of maple syrup. Never done the toasting thing, look forward to trying that. I love this! I would also add organic (or not) raisins that I replump in orange juice. Warm some oj on the stove and then add in your raisins and take off heat, they will absorb the juice and replump. Then when you bite into them they are moist juicy and delicious! For the leftovers; put the cooked leftovers in a covered container in the fridge. After it hardens into that familiar gelatinous state, slice, fry or saute and serve like pancakes. Has anyone tried savory oatmeal instead of sweet? I don’t know what the vegan equivalent of rich chicken bullion (which I use as cooking liquid sometimes) would be, but it makes a nice alternative when coming in from a cold day in the yard. Great recipe , Thank You! Also like the soak overnight hint. For a variety of oats, and other whole grains I really like http://www.bobsredmill.com , they also have a wealth of recipes as well. I love this recipe. I did a variation that I like to call peach cobbler oatmeal at the behest of my 7 year old. I subed peaches for apples and nutmeg for cinnamon and there you have peach cobbler oatmeal. It was a big hit! My daughter even ate it cold the next day. I found you on my iPhone before I found your website. Thank you. I enjoyed not only this post, but also all the ideas from other post-ers, Thanks! I’m going to try the slicing and frying tomorrow, and plumping the raisins in orange juice next time I go to the store. I forgot to heat the water first, and found out why I should– it splattered all over everything. But no biggie. One other option– I’ve started adding chocolate to the cooking water since I’ve learned that chocolate is good for you. It’s the fats and sugar in the candy bars that isn’t good. So I use either unsweetened baking chocolate or cocoa powder. I’ve a bar of Baker’s chocolate– warning for those of you who have allergies or are purists– it’s manufactured on equipment that processes milk. I just started eating steel cut oatmeal in the mornings and I’ve discovered a GREAT trick. Throw the oats and water (I use 1 part oats to 3 parts water) in your slow-cooker before bed. Turn it on low and it will be ready to eat when you get up. I don’t think it gets easier than that! This is awesome. I just became a vegetarian for dietary reasons and was thinking that it would be splendid if I could find a recipe for Steel cut oatmeal that is cinnamon and apple flavored, since I too loved the instant stuff. I was so gleeful when I found your pictures of this on Flickr, and then through your link found this post. I am sure to give this a try. POM has a recipe that is steel cut oats with canned pureed pumpkin, brown sugar, raisens and pomogranite. It is to die for, but it’s hard to find poms this time of year. The recipe is probably on their website. I should mention, on there they actually call it a Brulee. How can you eat these steel cut oats? I tried this recipe, toasted them to bring out their ‘flavor’ and made it exactly like the recipe and it tasted so gross. I can sometimes eat regular oatmeal but these just have a taste or texture that isn’t right. My kids eat oatmeal every morning and gagged and spit this stuff out when they tried it. I even tried adding maple syrup and then finally chocolate in an attempt to be able to eat them and finally gave up. The sad part is I eat healthy and want to be able to eat these oats but can’t find a way that I can stomach. Does anybody have any good recipes for these that hides how bad they taste? Oatmeal is one of my favorite comfort foods and I couldn’t resist the charming tin of McCann’s Steel-Cut Irish Oatmeal. I’ve made this recipe a few times and loved it. It is easy, quick and delicious! It is so good to hear that so many of you love steel cut oats! I love them too. I am with McCann’s Irish Oatmeal, and love to see creative ways to prepare steel cuts. Also, soon we will be up and running on facebook. There you can find all the latest news on McCann’s Irish Oatmeal! I used to eat protein shakes for breakfast but have switch to oats which is so much cheaper & satisfying. Ya, soaking the oats overnight actually make it so much tastier. I make steel cut oatmeal in my rice cooker. Some sophisticated rice cookers have a special setting for this but mine is just a simple one. Before bedtime I put 1/4 cup of steel-cut oats and some cinnamon in the rice cooker along with a cup or a cup and a quarter of water. Turn on the rice cooker and soon a delicious cinnamon smell wafts through the house. When the water has evaporated, the cooker automatically goes to the “warm” setting where I find it in the morning. I then add a cup of yogurt and have a great breakfast. I like the idea of apple, however, and am going to put some applesauce in the mixture and see how that works. I read about steel-cut oats on another food blog, Pinch My Salt, and then wound up here after rooting through the interwebz trying to figure out the best way to make some oatmeal outta them. So, cheers, I am so in love with this recipe! I made it last weekend. Forget Quaker Instant Oatmeal packets. Real food is delicious and rewarding. I made another batch of oatmeal today so I’d have something to bring to work for lunch. Since my mum brought back some ground vanilla beans from her cruise, I added some of that along with almond extract, slivered almonds, and dried cranberries to the oatmeal. I am somewhat in love. Thanks for your recipe.. This looks so healthy and delicious yum yum…I love the ingredients you have used here..
so when making / soaking them for overnight, can I put the pot in the fridge? Or does it remain out overnight?